Shern's school is celebrating Book Week this week. 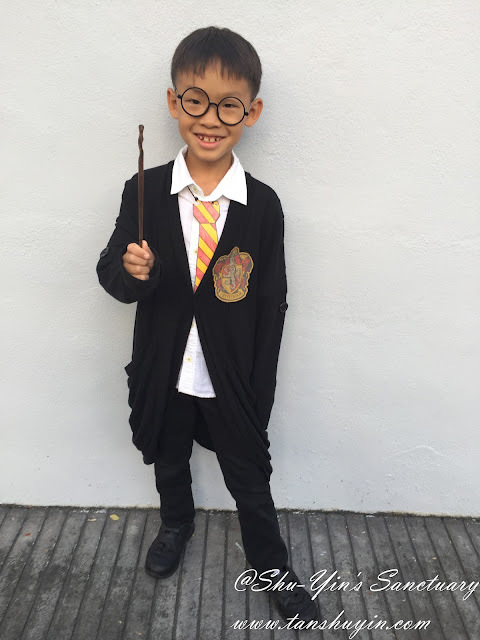 His school has always been promoting the enjoyment of reading, and so naturally they really was into the Book Week celebration. They invited parents to go to school to share stories with the children, so that the children are exposed to stories from all over the world. They also had a book swap in which the student can bring their books they'd finished reading to swap for different books from other students. And the biggest event of the week is the Dressing Up Parade. 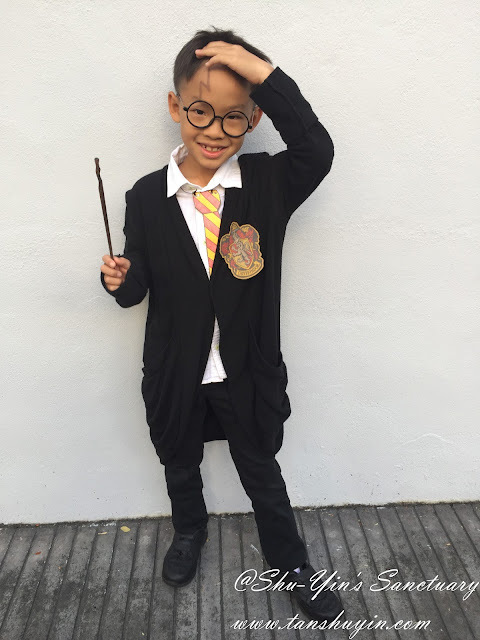 Students are encouraged to go to school dressed as a character from a book. Everyone will have a mini parade in the field and parents are encouraged to stay too. It was all fun stuff in his school the whole week! Shern came home and told me one week before that he wants to be Harry Potter. I was busy last week and also this week so I just started thinking of ideas in my head. I knew I needed to have a black robe of some kind and Harry Potter's glasses. I did publish in my personal Facebook page to ask if I can borrow a black trench coat or a black coat of some kind. No such luck. No one has a black trench coat his size. So I needed to improvise. Two days before the Parade day, I went to Mr. DIY and thank goodness I found the last pair of a circle black rimmed sunglasses for just RM2.30! It was actually quite difficult to break the tinted shades in the sunglasses. Hubby helped and voila, that was Harry Potter glasses! 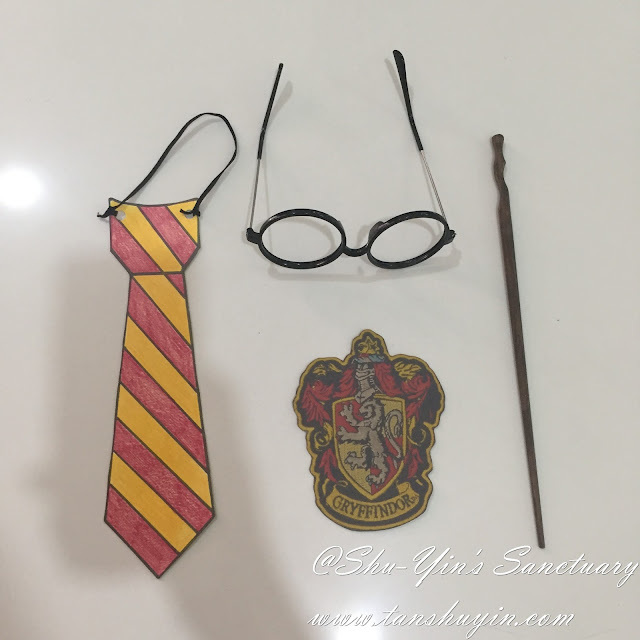 Went to Mr. DIY and Daiso to find a tie or a scarf in Gryffindor colour (scarlett and gold/red and yellow) but couldn't find any suitable one! We ended up printing a tie from the internet and then coloured it ourselves, and tada....Harry Potter Gryffindor Tie! We also put a black rubber string for the punched tie so that it goes around his neck. As for the Gryffindor Crest badge, I just printed it off the internet too, and attached a safety pin behind with a Scotch Tape. 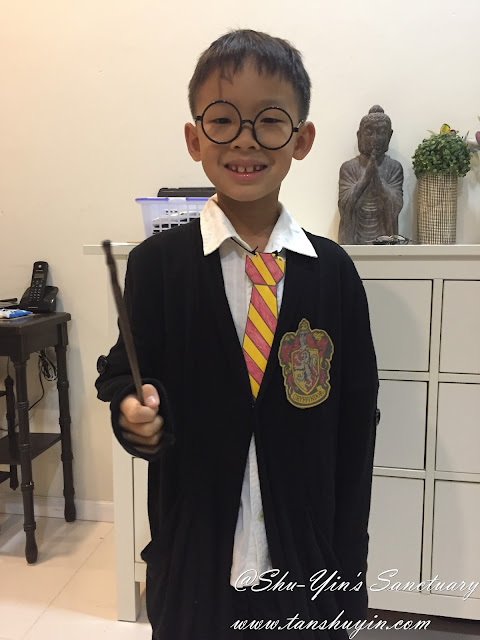 I gave him a chopstick as his wand. 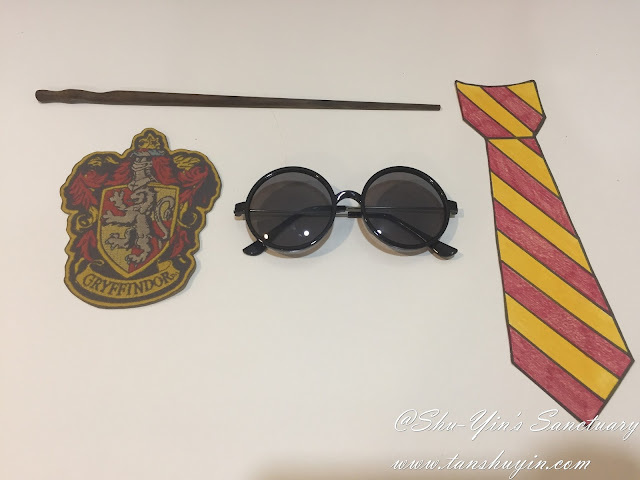 We had this suitable dark brown wooden chopsticks with a slight curve at one end, so it was perfect as his Harry Potter Wand! And the most important one of all is the lightning scar. I took my eyeliner, and just drew on his forehead and so he has a Harry Potter Lightning Scar! I dressed him in a white shirt, and in the end, borrowed my mum's clingy sweater robe and it was perfect. I pinned his Gryffindor Crest onto the robe. 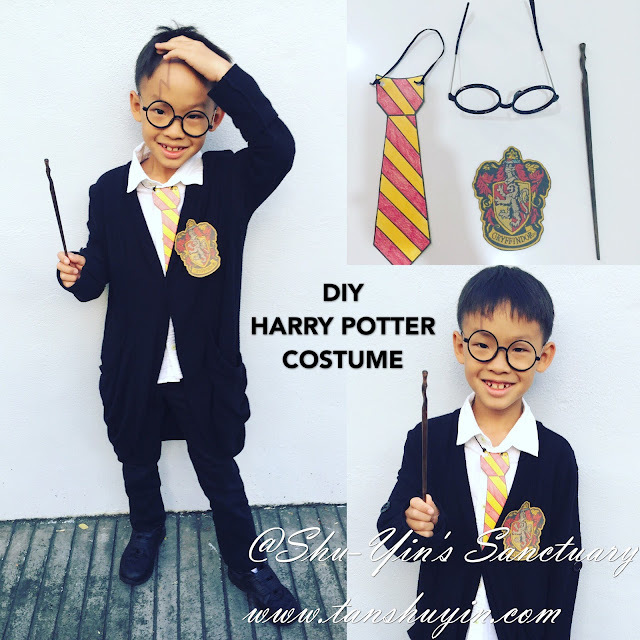 I then paired it with black pants and black shoes and he looks great in his Harry Potter Robe! 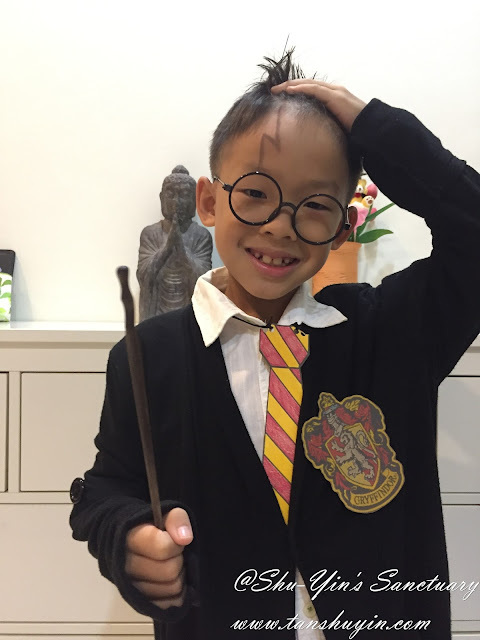 This was how he looks like all dressed up as Mr. Harry Potter! A last photo of him posing with his lightning scar! Have a good Book Week people! Happy reading! Khye Can Read @ 4 1/2yo!